100% Berries & Whey is for anyone who desires additional protein in their daily diet. • Contains 100% pure Ultra-Filtered/Micro-Filtered (UF/UM) Whey Protein Isolate, the finest quality and most easily assimilated whey protein isolate on the market. 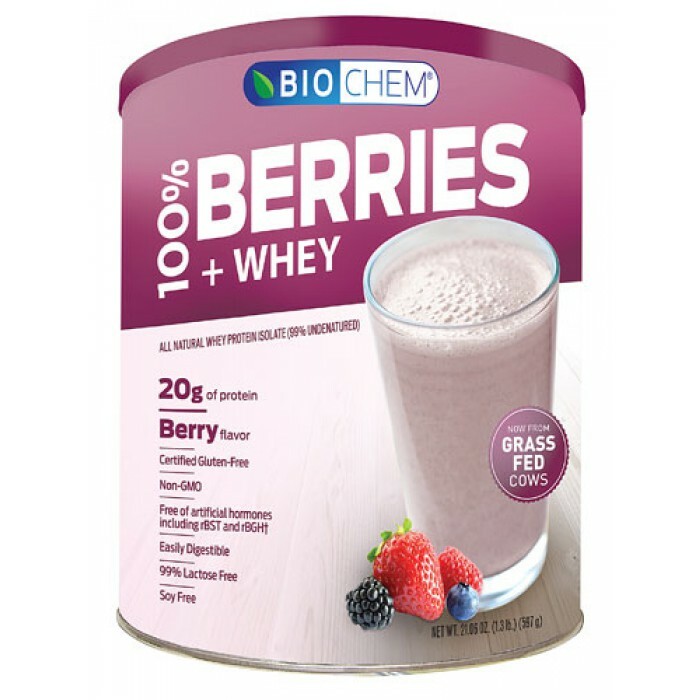 The Micro-Filtration method isolates the natural whey proteins in a highly concentrated form without fat or lactose. This process leaves 99% of the peptides undamaged and undenatured. • 100% Whey Protein has the lowest molecular weight of any protein. This allows your body to absorb it quickly and easily without bloating, gas or stomach upset. • 100% Whey Protein is rich in the highly bioactive fractions glycomacropeptide, immunoglobulin, glycopeptides, and lactoferrin. These components feed muscle tissue. • The consumption of a variety of berries has been suggested in clinical research to support eye health, urinary tract health, and has shown strong support in the aging process. Berries naturally possess a high ORAC (oxygen radical absorption capacity) value. ORAC is the measure of antioxidant activity. • Blackberries contain anthocyanin pigments which have powerful antioxidant properties. Blackberries are a rich source of vitamins C and E and are considered a rich source of fiber. • Scientific experts suggest that blueberriespossess as much as 10% more antioxidant strength than many other berries. • Strawberries possess a very high ORAC value and are a natural source of vitamin C.
• Raspberries are a rich source of vitamin C and fiber. They possess powerful antioxidant capabilities similar to blackberries. • Acai berries are similar to blueberries, contain all essential amino acids, and are rich in vitamins and minerals. • Goji berries are unique in that they have been used in traditional Chinese medicine because they contain four primary polysaccharides. These polysaccharides act as cell messengers and support overall health.